Coleraine FC have released Sammy Morrow from the club. 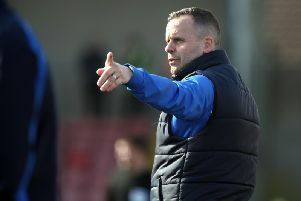 Boss Oran Kearney thanked the striker for the contribution he made in his second spell with the Bannsiders after he rejoined the club in May 2015. “Sammy is a model professional and we are sorry to see him go, but we understand he wants to be playing regular football,” said Kearney. “He has sacrificed a lot during his second spell here, but he has also played a vital role in the development of our young players. “The more the likes of James McLaughlin and Jamie McGonigle developed it meant Sammy’s opportunities were becoming more and more limited, but his attitude always remained first class. “He was always there to encourage and offer advice to the young guys. “I’ve saw other experienced players at different clubs who almost resent young players breaking through in their position, but not Sammy he always put the good of the team first. “There was obviously times he was disappointed not to play but he never let that disrupt the team. “He will be sorely missed in the changing room and around the club, he’s a great guy and a great example to any young player.